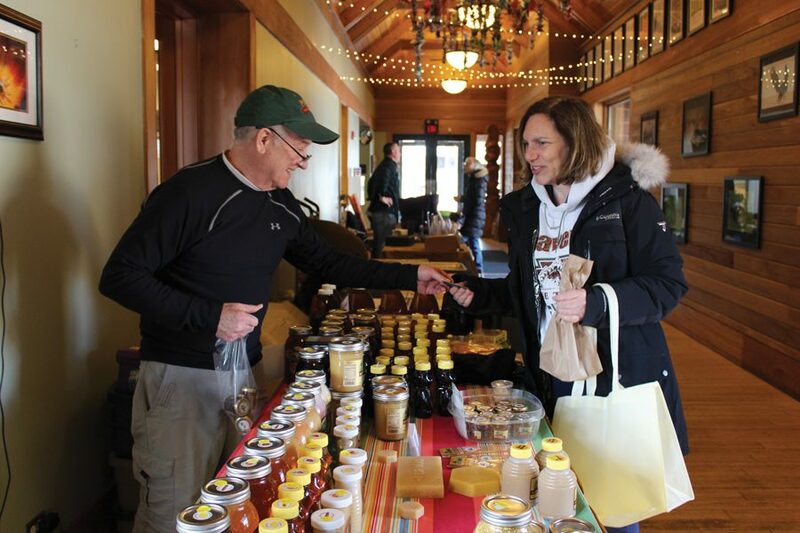 John Brandell, owner of Frosty Productions, sells his honey and maple products to customer Ronda Patino. He is a vendor every week at the Evanston Ecology Center Indoor Farmers' Market. Every Saturday morning from December to April, the Evanston Ecology Center comes alive as vendors set up for the city’s indoor farmers’ market. Businesses from across the Midwest and Chicagoland area share their offerings at this weekly event, highlighting fresh food and other unique products. In its eighth year of operation, the Evanston Ecology Center Indoor Farmers’ Market draws between 150 and 200 customers each weekend, Matt Poole, program coordinator at the Evanston Ecology Center, said. He said a few vendors from Evanston’s outdoor farmers’ market began to rent out the space in 2012. The City of Evanston eventually took over and now runs the event. Dušan Katić, head baker of Katić Breads, said of all the benefits the market offers, nothing compares to the “one-on-one connection” with customers. Katić said the indoor farmers’ market is essential to what he sees as a “mutual relationship” between business owners and customers. Poole said the indoor farmers’ market has a few new vendors every season, but others have been a part of it for years. The 2018-2019 season is Dawn Cibak’s fourth year participating with her company Morsels Patisserie. She, like many other vendors, does not have a storefront. Because of this, Cibak said the indoor market is a good source of exposure and a nice place for customers to pick up orders they placed online. Whether a vendor is a veteran member of the market or new to the scene, said Angela Maicki, owner of City Press Juice & Bottle, the market has a “great sense of community among our supportive customers.” She is “fortunate to have become friends” with those who attend the market, many of whom are regulars like Evanston resident Joe Meador. Meador said he and his wife are avid farmers’ market attendees. When they moved to Evanston, they became fans of the outdoor market, which then led them to discover the winter indoor market.